With step-through frames, small wheels, automatic transmissions and small engines, scooters are a great way to get around town quickly and avoid soaring gas costs. These bikes allow riders to find ways to avoid traffic, locate easy parking, and take care of quick, around-town errands cheaply and with minimal interruption. And even though the definition of what a scooter is continues to evolve as these bikes change to match buyer trends, popularity and design alterations, the need for comprehensive scooter insurance has not wavered. RV America recognizes that the right policy is of utmost importance for bikes of all sizes, including scooters. Our goal is to help you pinpoint the coverage options that best match your lifestyle and budget. Your first step is to check out a cheap motorcycle insurance quote for free right online. Click here for your free insurance quote. 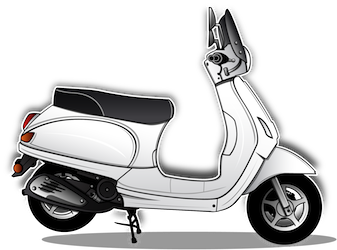 For more information on our scooter and vespa insurance you can email us at info@rvainsurance.com or call us toll-free at 1-888-803-5999.